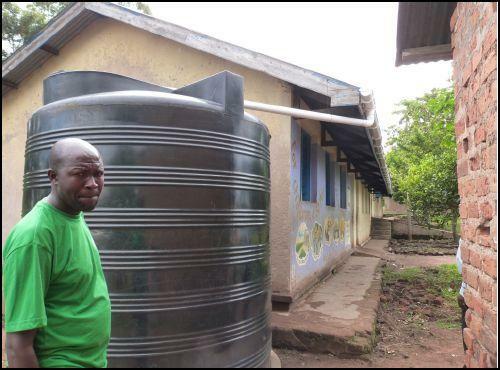 Mr Francis Olowo, deputy Head teacher with the water tank and the 40 metres of guttering used to fill it. In January 2014, after a visit and talk to the club by Peter Dingle, the Head teacher at Nanstallon Primary School, Wadebridge Rotary Club donated £200 to support the schools’ fund raising efforts to provide a source of water for the Morkiswa School in Eastern Uganda. The club has now received this letter from Peter, showing how the money was spent and the benefits to the Morkiswa pupils. Nanstallon School near Bodmin enjoys a partnership with Morkiswa School in Uganda. In 2013, following a visit from Mr Oketch, the Head teacher at the school, we decided to try and raise funds for that school to have a reliable and safe source of water. Your organisation was one of those that helped to raise £1400 to make this a reality and when he visited Morkiswa in autumn 2014 our Head teacher was able to hand over the funds to enable the tank to be installed. It has been in place for nearly a year and eventually we have been able to get some good quality photos of the tank to share with you. Mr Oketch tells us that it has made a tremendous difference to their routines and their lives and they are very thankful. The water tank holds up to 8000 litres of rainwater. It is used to help the children to wash their hands, to feed crops in the dry season and for a myriad of other purposes. Many thanks to all of those who helped Nanstallon school raise the money for this project.